Since The Ehlers Group opened its doors in 1994, our focus has been in senior housing industry. We have been creating effective senior housing marketing programs bringing traffic and sales to our client’s communities across the country. Our specialization offers a special understanding of continuing care communities (CCRC), independent, assisted living and memory support communities and we have worked with communities of all sizes. We understand the sales process behind each and assist in bringing name recognition through various marketing channels. The various phases of marketing from launch through lease up and repositioning tap The Ehlers Group’s talents. From daily newspapers, trade magazines, broadcast media and radio, our clients’ communities receive excellent press coverage. Our innovative and creative marketing and public relations tactics have also garnered numerous national awards. Our marketing efforts bring social media into the senior housing marketing mix. We know how to communicate our clients’ story with an individual touch that separates a community from its competition. 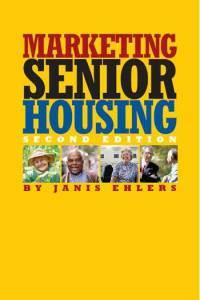 Marketing Senior Housing, by Janis R. Ehlers, is an excellent book for those in the senior housing industry and is packed with practical, proven senior housing marketing strategies to reach consumers, families and referral resources. To order a copy, please click here.